The meat and potatoes, heart and soul, sum and substance of a site. This is where you put your stuff! Choose from several content types to establish page layout and accommodate a wide variety of material such as text, images, videos, tables, slideshows, news feeds, calendars, link lists, and so much more. No way, José! You can add multiple content types per page and rearrange them as you see fit. Page layout is highly configurable; you could start with a paragraph of text, transition to a grid, throw in a wide open space, and end with a slideshow. However, we do recommend against using too many content areas on a page as more stuff = more load time. I can&apos;t sleep at night because I have anxiety about picking the wrong content type. Please help. Relax, there's no need for anxiety. Figuring out what content type to use might seem daunting at first but there are recommended uses for each. Click on a content type below for suggestions and examples. 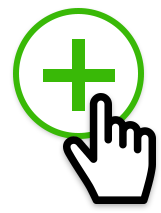 And best of all, switching between content types is as easy as clicking a button! An open content area with optional add-ons to engage your websites visitors. Boxes of content that span across the full width of a page. Pairings of images and text in an automatically rotating display. 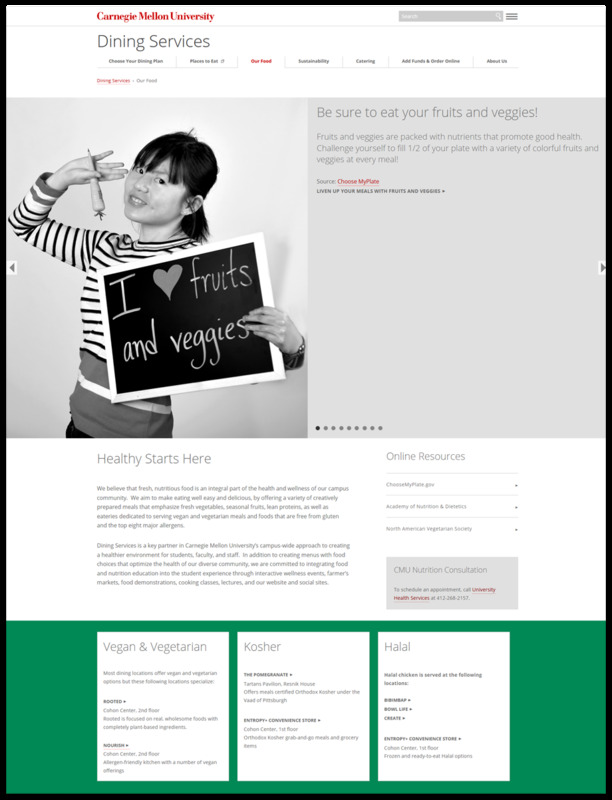 A full-width open content area which can be used for a magnitude of things! All pages can contain multiple content sections with each using a different content type. Click the plus sign (+) near the heading label of an existing content section to add another. More on adding, removing, and rearranging content. Don't miss the inspirational examples below for ideas on combining multiple content types on a single page. 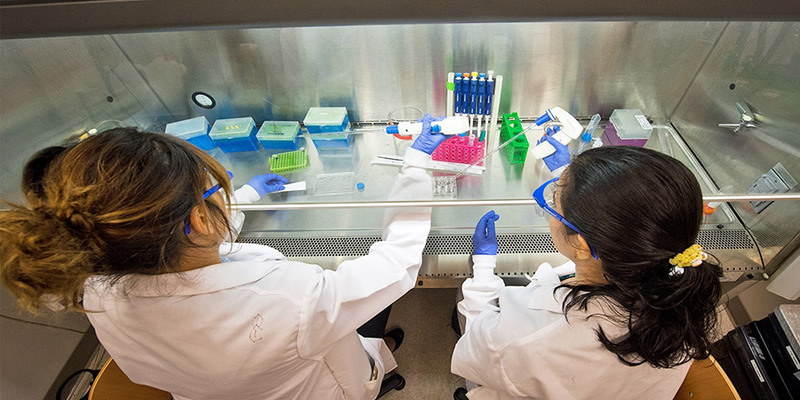 Scientists experimenting in the CMS lab to determine the best content combinations for a viable page. There are an infinite amount of page layout possibilities that can be assembled using a combination of content types. Like pizza and ranch dressing, apple pie and cheddar cheese, potato chips and chocolate, here are some great combinations to whet your appetite. 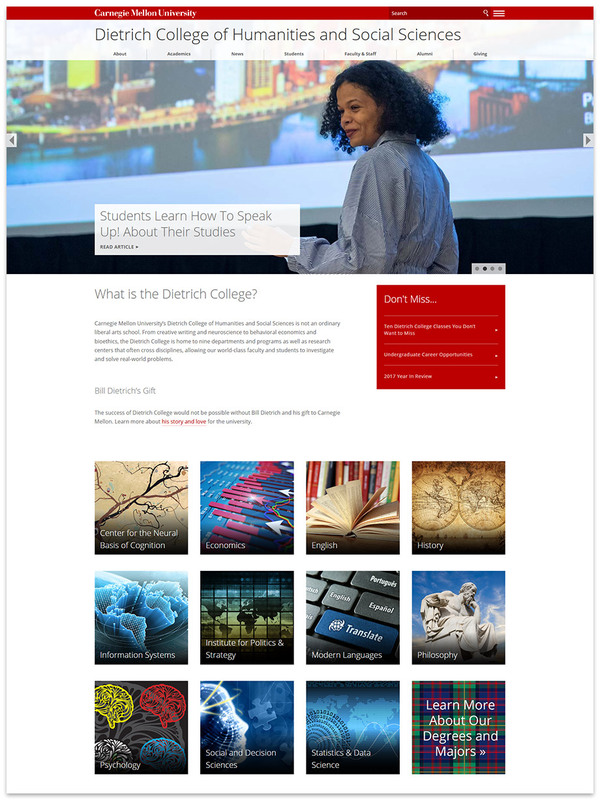 Below a Hero, Dietrich College's home page contains a content WYSIWYG and grid. This Dining Services' page starts with slideshow followed by a content WYSIWYG and grid. 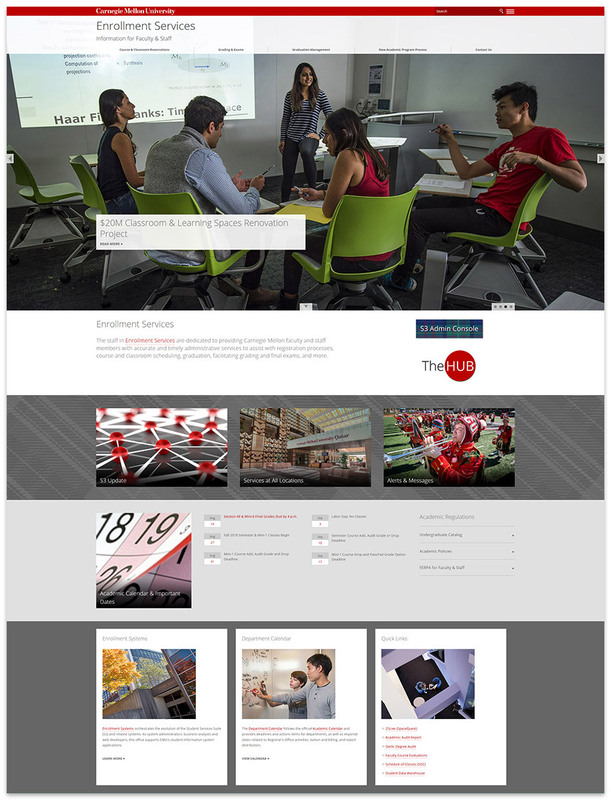 Below a Hero, the university's Student Experience page uses a content WYSIWYG and grids. 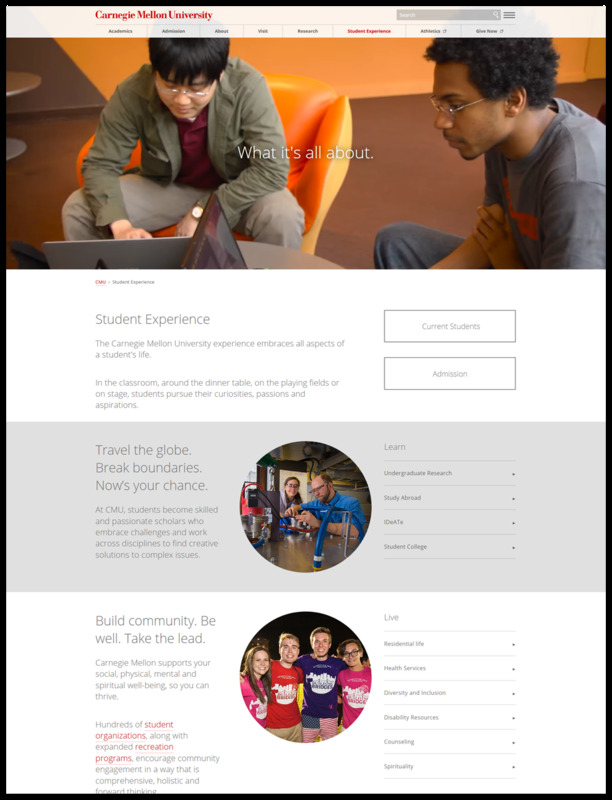 Below a Hero, Enrollment Services' home page uses a content WYSIWYG and a variety of grids. 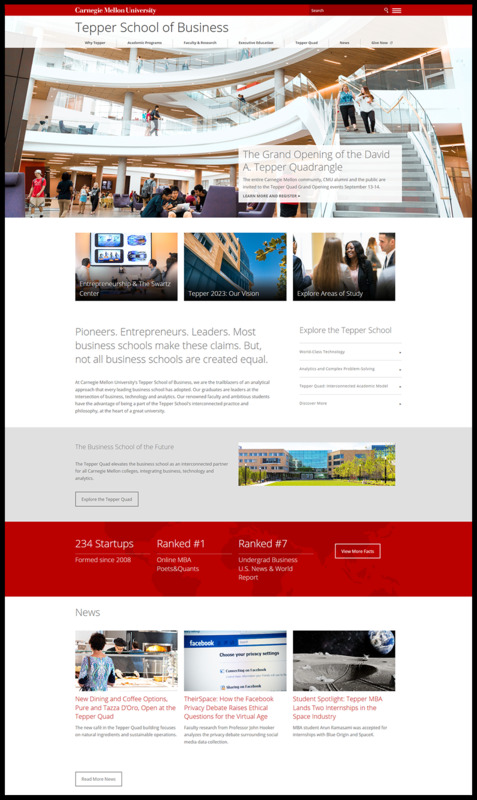 Below a Hero, Tepper School of Business' home page uses a variety of grids and a content WYSIWYG. 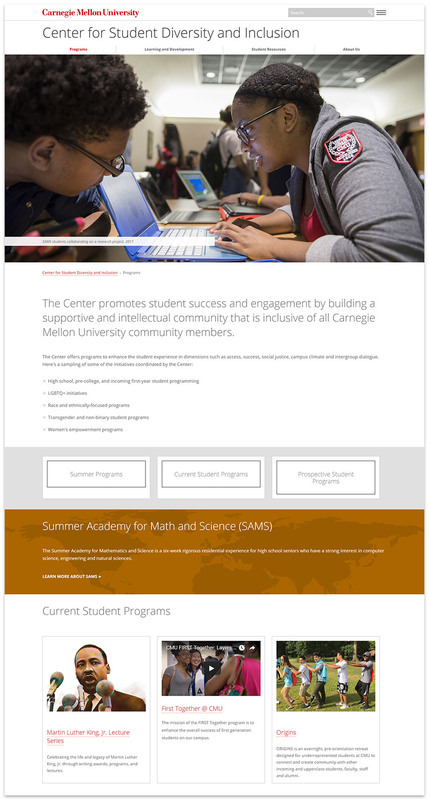 Below a Hero, the Center for Student Diversity and Inclusion's Programs page uses a combination of wide and grids.